Join us in San Jose, CA, February 14–17, 2012, for the 10th USENIX Conference on File and Storage Technologies. FAST '12 brings together storage system researchers and practitioners to explore new directions in the design, implementation, evaluation, and deployment of storage systems. The FAST program will again be offering tutorials, which will be taught by expert instructors including Brent Welch and Jiri Schindler and will take place on Tuesday, February 14. Beginning on Wednesday February 15, the technical program includes 26 technical papers, Work-in-Progress reports (WiPs), and two poster sessions. The USENIX Nominating Committee is pleased to announce the candidates we are nominating for the upcoming USENIX Board of Directors election. Find out more here. All videos of conference technical session presentations now will be available to the general public on the USENIX Web site shortly after they take place. This shift in policy is aligned with our dedication to fostering innovation and providing open access to research. In addition to offering video content on the USENIX site, select videos will also be available on the USENIX YouTube Channel. USENIX is on the forefront of the open access issue and has offered free online access to conference proceedings since 2008. 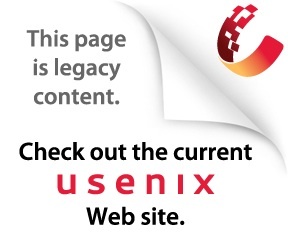 Interested in supporting USENIX? Become a member today. Keep track of paper submission deadlines, early bird registration deadlines, and USENIX conferences themselves on the new USENIX Events Google Calendar, also available in iCal format. Subscribe today! Submissions due: February 16, 2012 Deadline Approaching! Submissions due: February 23, 2012 Deadline Approaching! Thanks to those of you who joined us in Boston, MA, for LISA '11. Check out the online proceedings of the technical program. Just Up! Videos and slides of the presentations are now available. Click here to find out more. For USENIX members, the full February 2012 issue of ;login: is now online. Articles free to everyone: "Btrfs: The Swiss Army Knife of Storage," by Josef Bacik, editor Rik Farrow's "Musings," book reviews by Elizabeth Zwicky and Sam Stover, and conference reports from the 14th International Workshop on High Performance Transaction Systems (HPTS). Not a member? See a sample of what you're missing. Want to get ;login: on a regular basis? Join USENIX. Members rate ;login: the number one membership benefit. Now playing: Subscribe to the USENIX YouTube channel for the latest conference videos and greatest hits. See more USENIX multimedia here. Ordering systems on this site switch to our secure server to provide encryption.